California legislative knuckleheads really don’t know how stupid they look, do they? They’re too busy saving the world while the state burns. While California drowns in debt, its public schools are failing and ranked with some of the lowest reading scores in the country, criminals are being let out of prison and jails and crime is spiking, water is cut off to our farmers*, illegal aliens and “refugees” are arriving in droves as Democrats are trying to pass legislation making California a sanctuary state, one dam we know of may blow apart (who knows about the rest…),bridges are falling down, highways are crumbling, and Democrats flout federal election laws by allowing millions of illegals to vote, Jerry and his corrupt Democrats in the statehouse (and feckless Reps) are introducing bills at lightening speed to add regulations, massive tax increases, more gun control, restricting more freedoms, all while prattling on about climate change and nuclear war. And Governor Moonbeam is mulling ways to prevent the end of the world, because everything he says and does is so brilliant. Well, Jerry thinks so. Brown is an ignoble narcissist… unless he is trying to destroy the state… If so, he’s doing a bang-up job (she says ironically). Jerry is malevolent, lethal, and frankly malignant. And the Dems in the Legislature are just as bad in this Democrat-controlled state. But none of this could happen without the help of the media. If any of the Capitol reporters were actual watchdogs, Jerry Brown would never have been reelected in 2010. Here is another gross display of media swooning, and an example of a stretch in reasoning? “California voters rejected Donald Trump during the election, and the state’s leaders continue to push back on his initiatives. On issues from health care to immigration, California’s governor and Democratic leaders oppose the new president,” Maureen Chowdhury and Christopher Cadelago wrote in the Sacramento Bee under a photo. Unelected, largely anonymous appointees are somehow representative of the voters who rejected Donald Trump during the election. “California environmental regulators, taking a defiant stand against President Donald Trump on climate change, reaffirmed their commitment Thursday to tough standards to reduce greenhouse gas emissions from cars,” the Bee reported. However, nowhere in the article did the truth emerge: Emissions are down m ore than 90 percent over the last 20 years. A 2015 USC study found that child respiratory disease is dramatically down in the Los Angeles basin. “We saw pretty substantial improvements in lung function development in our most recent cohort of children,” said lead author W. James Gauderman, professor of preventive medicine at the Keck School of Medicine of USC. So, what is cost and/or benefit for further regulation by the California Air Resources Board? While California burns, Gov. Jerry Brown distracts by mulling ways to prevent the end of the world (and the media complies). And the Democrat-dominated Legislature, largely filled with people who have never held private sector jobs, continue to create a permanent poverty underclass, while at the same time creating absolute dependency of the voters to state government, and daring President Trump to withhold federal funds. *”Many farmers, farm workers and communities that rely on the CVP for water supply received only a 20% allocation in 2013, no allocation in 2014 and 2015, and only a 5% allocation in 2016 despite a normal rainfall that year and available water in state reservoirs,” according to Sen. Andy Vidak, who this week sent a letter to the secretary of the U.S. Department of Interior requesting that Central Valley Project contractors receive a 100% allocation of water this year. The irony, as usual will be lost on the Leftists. 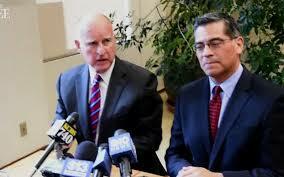 Jerry Brown still thinks acts like he’s getting in and out of limos with Linda Ronstadt. Seriously, I thought he’d be gone by now.